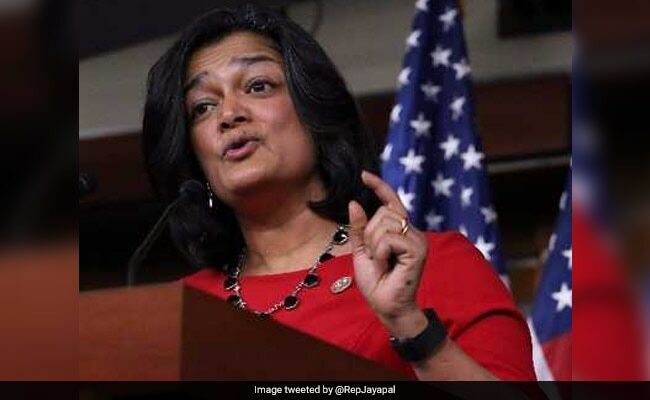 Pramila Jayapal founded a nonprofit called "OneAmerica" in Washington after the Sept. 11, 2001, terrorist attacks that declared Washington State a "hate free zone," and lobbied on behalf of immigrants. For Pramila Jayapal the rant wasn't about just a policy issue. It's also personal. A Washington State U.S. congresswoman listened as a man named John from Sebring, Indiana, went on a screed about "illegal aliens" reaping government benefits and stealing American jobs. At first she shook her head slightly in disagreement, but then she sat expressionless as he went on. For Rep. Pramila Jayapal, D-Wash., the caller's rant wasn't about just a policy issue she's passionate about - though she is, deeply. It's also personal. For Jayapal, the immigrant experience is not theoretical. She was 16 when her parents used all of their money, around $5,000, to send her alone from India to the U.S. to attend Georgetown University. Though she was never undocumented herself, she waited 17 years for citizenship, bouncing between visas and later obtained permanent resident status when she married an American man. She's fought for immigrant rights her whole life as an activist, and last November, despite the anti-immigrant rhetoric that flared up during the presidential campaign, she became the first Indian-American woman to be elected to Congress. So last week, when John called into C-SPAN's Washington Journal to complain about "these illegal aliens," and to call for children of undocumented immigrants to be "deported just like their parents," Jayapal steeled herself. Even after all this time, after being called names and harassed throughout her life here, it still stings. But Jayapal didn't focus on her own pain. She focused on John's. "John, it sounds like you are in a lot of economic pain and that is true across the country, and there is no question we as a country need to deal with economic inequality and make sure we have good paying jobs for everyone," she said, her voice even. "I am committed to that and I'll tell you that right here looking into . . . I can't see your face, but looking into your eyes, I'll tell you to blame immigrants is completely wrong and here's why." C-SPAN's program is not like other news shows where two sides can go several rounds in a dramatic, heated exchange. So after Jayapal explained to John that most undocumented immigrants are not taking public benefits and urged him to focus his blame on corporations that don't pay their fair share rather than at immigrants, she has no idea whether what she said resonated. Jayapal founded a nonprofit called "OneAmerica" in Washington after the Sept. 11, 2001, terrorist attacks that declared Washington State a "hate free zone," and lobbied on behalf of immigrants. In 2013, President Barack Obama named her a "Champion of Change." Asked about the chances for immigration reform, she optimistically said, "I really believe that we're going to make it happen this year." It's with that same optimism that she tries to approach conversations with people like John, she said. "I think it's important instead of just calling people out, I think it's important to call people in," Jayapal said in a brief phone interview. "Of course I heard the rants and it always feels personal, and it never stops feeling personal because they are talking about people like me, but I also heard pain in his voice. I find if you start there and acknowledge something the other person said that rings true to you, I can get people to open up to what I want to say next." She recalled a time she was chatting with a man who was furious about undocumented immigrants not paying taxes, but reaping the benefits of living in America. She explained to him that actually, because those people often use fake Social Security numbers to find work, they do pay into the system. But when the government can't match the number to a person, the money goes into a so-called earnings suspense fund, which collects billions each year from unauthorized immigrants. Which actually means, she told him, that they are paying money into a benefits program and will never see the benefit. She said he was stunned, and afterward they were able to have a thoughtful conversation. They didn't come to a shared view on immigration issues, but the exchange of ideas was civil, which in today's heated political climate is a win. After John hung up, Jayapal told the C-SPAN host that throughout her years working on these issues, she's been threatened with lynching and other threats, but it's never deterred her from believing the best about Americans, she said. But even now, as an elected federal official, Jayapal is still fighting for respect. On the same day she appeared on C-SPAN, she voiced her opposition to an amendment offered by Rep. Don Young, R-Alaska, during a floor debate. He retorted firmly, "the good lady . . . doesn't know a damn thing what she's talking about." Then he said, "You may not know me, young lady, but I'm deeply disturbed." But Jayapal didn't cower. She calmly asked that he take down his words. Minutes later, Young apologized (though still addressed her as lady). Later, she offered these words of encouragement to her followers on Twitter. "A message to women of color out there: stand strong. Refuse to be patronized or minimized. Let the small guys out there be intimated by you."